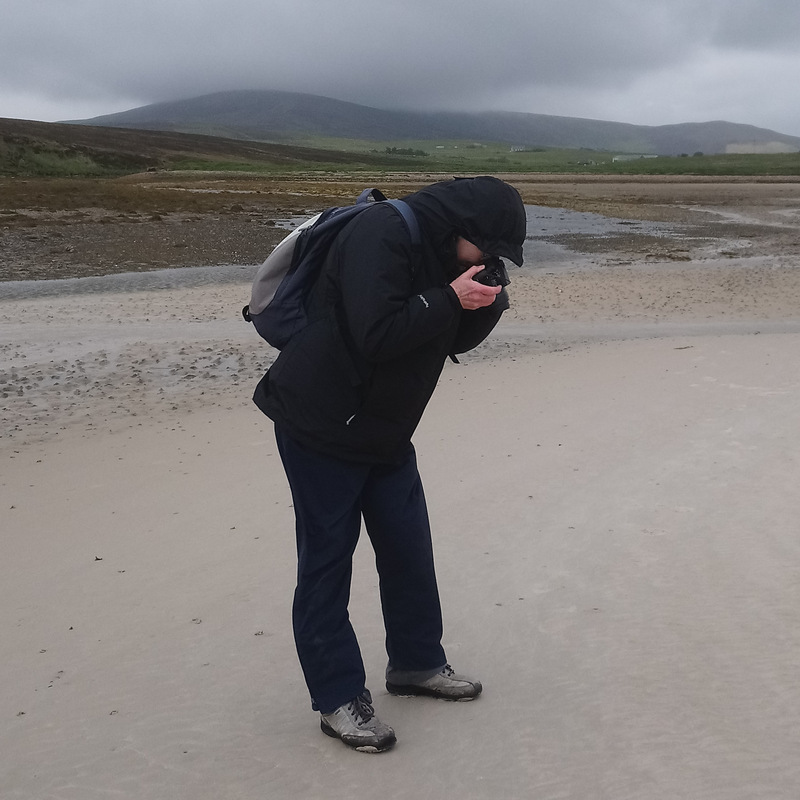 Waulkmill Bay in Mainland, Orkney, is one of the most beautiful beaches I have ever seen, even on a dull, windy, and very cold day in June last summer. It is situated on the south-east coast of West Mainland and opens into the famous Scapa Flow. This post acts as the context for the detailed photographs in earlier posts about the sand, water and rocks on the beach. Waulkmill Bay is very close to the RSPB Hobbister Nature Reserve. We parked on the narrow road at the top of the cliffs on the east side of the bay. There was only room for two cars. The steep path took us down the thickly vegetated cliff-side covered with masses of heather (not yet in flower and looking very dark and dry), intermixed with the glossy strap-like leaves of wood-rush, and small bright green ferns. Lower down there was a lot of taller bracken. I couldn’t see any of the native aspens said to cling to the edge here. The views of the bay were spectacular and enticing. I took photographs at intervals as we made our descent. The pristine white sand at low tide stretched a vast distance out to sea from the stony bar blocking the head of the bay. This is area is a site of special scientific interest. Skaith saltmarsh has developed behind the rocky, stony bar and is the largest in Orkney. A small river called Mill Burn flows along the western boundary of the bay, draining south from the shallow water of Loch Kirbister, through salt marsh and bar, and the out over the sand to the sea. I suppose the thing about visiting places few people go is that there are not well worn pathways (unless you have sheep paths), I thought of this as I looked at that tall and thick bracken. It does look very beautiful. Thanks for sharing. I know what you mean, Emma. Fortunately, the path was not very overgrown at the time of visiting because summer is a bit late in arriving in Orkney and growth had not really got going. I think it averaged about 9 degrees C last June with wind chill factor. More than a jumper – I had four or five layers of clothing and wished I had taken my gloves on holiday.